A total of 132 children aged 12 and below were injured in road traffic accidents in the first half of this year, up from 128 in the same period last year. "We can avoid and prevent needless tragedies, and more can be done to educate and instil road safety habits in young children," said Senior Parliamentary Secretary for Education Faishal Ibrahim. He was speaking at the closing of the 37th annual Shell Traffic Games - which tests pupils' road safety knowledge - at the Road Safety Community Park in East Coast yesterday. In his speech, Associate Professor Faishal noted that children are vulnerable as they may not understand the dangers present on the road, and their size makes them less visible to motorists. He cited a video that went viral in October, showing a six-year-old boy dashing across Leedon Road and being hit by a car. He was flung off his kick scooter. "Fortunately, the boy suffered only minor injuries. This is why I cannot stress enough how important it is for us to teach children about the dangers on our roads," said Prof Faishal. Three educational animation videos for children were also launched at the event. The videos are a collaboration between the Singapore Road Safety Council, students from Nanyang Polytechnic's School of Interactive and Digital Media, the Traffic Police and oil company Shell. The videos will be distributed to all primary schools and can be found on the Singapore Police Force's Facebook page and YouTube channel. They aim to educate pupils on key road safety practices - the kerb drill; looking out for blind spots; and the dangers of crossing the road while distracted. 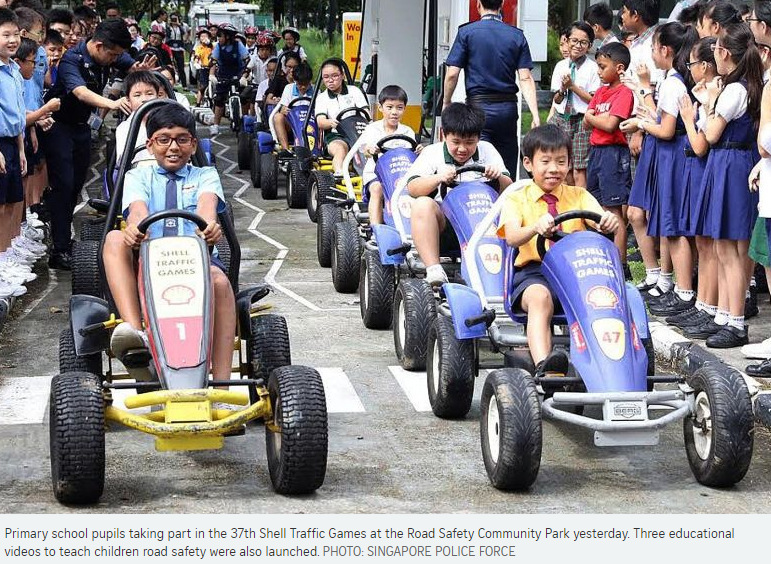 Earlier this year, the Traffic Police added the Road Safety Community Park mobile application to its training curriculum for children. It includes a virtual reality experience to simulate crossing the road, complete with 360-degree videos and an interactive game. "Everyone of us is a road user, either a pedestrian, a cyclist or a driver, and each of us has a part to play to make our roads safer," he said.